We cannot change the future by trying to erase the past. Tearing down a statue is not a solution to racism — ending the drug war is. On Monday, protesters — reacting to the violence in Charlottesville over the weekend — brought a ladder and some rope to North Carolina and tore down a near century old statue of a Confederate soldier. Unsurprisingly, nothing changed. 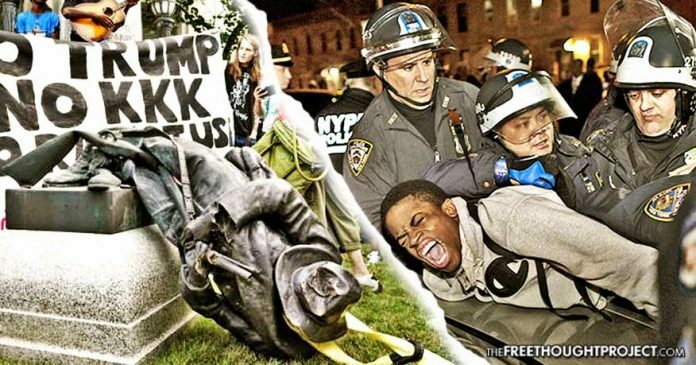 However, the Durham Police Department and the Durham County Sheriff’s Office announced that they will be seeking criminal charges for those involved in the destruction of the statue. Watching people wage violence against their fellow human in the name of protecting or tearing down some arbitrary government artifact is as disheartening as it is frustrating. The future cannot be changed by attempting to erase the past. A statue holds no magical power to make people racists. If anything, the monuments to former racists serve as reminders that the state can and always will be open to the influence of bigotry — and only the state has the power to enforce racism. An ignorant racist is exactly that — however, if society grants that ignorant racist a political position or a badge and a gun, this ignorant racist now has power over you. Removing or keeping a piece of concrete will never change this. Jim Crow laws weren’t overturned because people went around town tearing down statues. Racist government laws were brought to an end because people refused to obey them. Had Rosa Parks used her time and energy lobbying to take down a statue instead of disobeying a racist law, rest assured Browder v. Gayle, which ruled that segregated buses were unconstitutional, would’ve never happened. Had the Civil Rights Movement in the 1950s not organized the Montgomery Bus Boycott, rest assured, desegregation would’ve taken much longer. Society has the amazing ability to force positive change through nonviolent and nondestructive means. However, all too often, we let emotions rule our thoughts and take to yelling and fighting in the streets and destroying property. This only serves to create more divide and empower the ranks of the racists. If we really want to put the brakes on a racist system, fighting with other citizens (even if they are devout racists) will never work. Boycotts, refusal of service, shaming, exposing — these are the tools we as citizens have against other citizens who are spreading hate and racism. One amazing private solution to racism actually just happened on Tuesday in Washington. Richard Spencer, the ostensible leader of the white supremacists, was forced to hold his press conference in his own house because businesses refused to allow him to rent their hotels. This campaign of public shaming and refusal of service is far more effective than tearing down a statue or attempting to use the government to ban hate speech. But what do we do when the state is perpetuating a racist system and prolonging the suffering of minorities? Again, the answer to that question is not to tear down a statue, but to realize where the power of this racism rests. In America, the area of government that is most responsible for maintaining a racist system, allowing racist actors to oppress their targets with impunity, and perpetuating the suffering and plight of millions through the persecution of morally innocent individuals — is the war on drugs. To this day, the racist intentions behind the war on drugs serve to further oppress black communities. The war on drugs is still creating criminals out of otherwise innocent individuals who’re caught in possession of arbitrary substances, removing their opportunity for employment by giving them criminal records, and guaranteeing a difficult future within the working class. It is no coincidence that the ACLU refers to the drug war as the new Jim Crow. The war on drugs subjects the United States to much of the same harm, with much of the same economic and ideological underpinnings, as slavery itself. Just as Jim Crow responded to emancipation by rolling back many of the newly gained rights of African-Americans, the drug war is again replicating the institutions and repressions of the plantation. And like slavery and Jim Crow, the drug war garners appalling levels of support. Each has its own rhetoric, each its own claims to unassailable legitimacy. The brutality of slavery was justified on economic and paternalistic grounds. Jim Crow pretended that separate but equal treatment sufficed, even as blacks faced daily lynchings and every form of overt discrimination. The drug war claims morality and protection of children as its goals, while turning a blind eye to the racial injustice it promotes. And with all three systems of oppression, much of society sits idly by, accepting the rhetoric that later will seem so unbelievably corrupt. We will one day understand that the war on drugs was a war on people and communities. If we really want to deal a blow to this racist system we must strike the root. The drug war is one such root. Until we eliminate the cause of this strife, tearing down all the statues in the world will do nothing. Until we realize that we are financing our own oppression and refuse to support the government programs that keep us in the days of Jim Crow, the tyranny will remain. It is high time we realize this real solution to this real problem before the entire country is so divided that we enter a new American civil war.